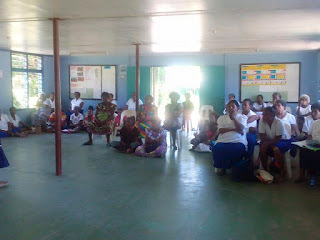 United Church Women’s Fellowship held a small cancer awareness program today for young women and mothers at Kirakira village, Port Moresby. Flora Lohia, Vice Chairlady for the Kirakira United Church Women’s Fellowship, stated that the cancer awareness program targeted young girls, women, and mothers who were more prone to contracting the illness – either breast or cervical cancer. “Many young women and mothers these days are contracting these cancers and it is our responsibility to help create awareness so that they can be able to treat the cancer at an early stage,” said Mrs Lohia. Kirakira United Church Women’s Fellowship Programs Leader Herea Lamond said that there were many breast and cervical cancer victims in Papua New Guinea (PNG) but most of them were too afraid to seek medical help or advice. “Through awareness programs like this, these women will be able to open up and find the proper medical help in which they need,” said Mrs Lomand. Mrs Lamond further stated that once these women are able to get the proper medical help they seek, they will also be able to take care of their families as well as educate their friends and other people in their small communities about this deadly illness.